Belemnites are coleoids, a group that includes squid and octopuses, and belemnites are sometimes, though not always, classified as a stem-group of squid ( Decapodiformes). Belemnoids may have been the forerunners of modern coleoid forms. Guards can give information on the climate, habitat, and the carbon cycle of the ancient waters they inhabited. Guards have been found since antiquity and have become part of folklore. ^ a b c Iba, Y.; Sano, S. -I.; Mutterlose, J.; Kondo, Y. (2012). "Belemnites originated in the Triassic—A new look at an old group". Geology. 40 (10): 911–914. Bibcode: 2012Geo....40..911I. doi: 10.1130/G33402.1. ^ a b c d e f g Monks, N.; Hardwick, D.; Gale, A. S. (1996). "The function of the belemnite guard". Paläontologische Zeitschrift. 70 (3): 425–431. doi: 10.1007/BF02988082. ^ a b Doguzhaeva, L. A.; Bengston, S. (2011). "The capsule: an organic skeletal structure in the Late Cretaceous belemnite Gonioteuthis from north-west Germany". Palaeontology. 54 (2): 397–415. doi: 10.1111/j.1475-4983.2010.01027.x. ^ a b c d e f g Klug, C.; Schweigert, G.; Fuchs, D.; Kruta, I.; Tischlinger, H. (2016). "Adaptations to squid-style high-speed swimming in Jurassic belemnitids". Biology Letters. 12 (1): 20150877. doi: 10.1098/rsbl.2015.0877. PMC 4785926. PMID 26740564. ^ a b c Doyle, P.; Shakides, E. V. (2004). "The Jurassic belemnite suborder Belemnotheutina". Palaeontology. 47 (4): 983–998. doi: 10.1111/j.0031-0239.2004.00395.x. ^ a b c d e f Wani, R.; Tajiki, A.; Ikuno, K.; Iwasaki, T. (2017). "Ontogenetic trajectories of septal spacing in Early Jurassic belemnites from Germany and France, and their palaeobiological implications". The Depositional Record. 61 (1): 77–88. doi: 10.1111/pala.12327. ^ a b c d Owen, R. (1844). "A description of certain belemnites, preserved, with a great proportion of their soft parts, in the Oxford Clay, at Christian-Malford, Wilts". Philosophical Transactions of the Royal Society of London. 134: 65–85. doi: 10.1098/rstl.1844.0006. ^ a b c d Stevens, G. R. (2010). "Palaeobiological and morphological aspects of Jurassic Onychites (cephalopod hooks) and new records from the New Zealand Jurassic". New Zealand Journal of Geology and Geophysics. 53 (4): 395–412. doi: 10.1080/00288306.2010.526548. ^ a b c d Hoffmann, R.; Weinkauf, M. F. G.; Fuchs, D. (2017). "Grasping the shape of belemnoid arm hooks—a quantitative approach". 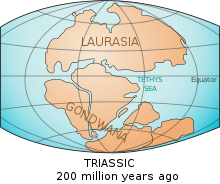 Paleobiology. 43 (2): 304–320. doi: 10.1017/pab.2016.44. ^ a b Lehmann, J.; Solarczyk, A.; Friedrich, O. (2011). "Belemnoid arm hooks from the Middle-Upper Albian boundary interval: Taxonomy and palaeoecological significance". Paläontologische Zeitschrift. 85 (3): 287–302. doi: 10.1007/s12542-010-0092-7. ^ Hart, M. B.; Hughes, Z.; Page, K. N.; Price, G. D.; Smart, C. W. (2018). "Arm hooks of coleoid cephalopods from the Jurassic succession of the Wessex Basin, Southern England". Proceedings of the Geologists' Association. doi: 10.1016/j.pgeola.2018.02.008. ^ a b c Tajika, A.; Nützel, A.; Klug, C. (2018). "The old and the new plankton: ecological replacement of associations of mollusc plankton and giant filter feeders after the Cretaceous?". PeerJ. 6: e4219. doi: 10.7717/peerj.4219. PMC 5765809. PMID 29333344. ^ a b Doguzhaeva, L. A.; Weis, R.; Delsate, D.; Mariotti, N. (2013). "Embryonic shell structure of Early–Middle Jurassic belemnites, and its significance for belemnite expansion and diversification in the Jurassic" (PDF). Lethaia. 47 (1): 49–65. doi: 10.1111/let.12037. ^ Laptikhovsky, V.; Nikolaeva, S.; Rogov, M. (2017). "Cephalopod embryonic shells as a tool to reconstruct reproductive strategies in extinct taxa". Biological Reviews. 93 (1): 270–283. doi: 10.1111/brv.12341. PMID 28560755. ^ a b c d Stevens, G. R.; Clayton, R. N. (1971). "Oxygen isotope studies on Jurassic and Cretaceous belemnites from New Zealand and their biogeographic significance". New Zealand Journal of Geology and Geophysics. 14 (4): 829–897. doi: 10.1080/00288306.1971.10426336. ^ Mietchen, D.; Keupp3, H.; Manz, B.; Volke, F. (2005). "Non-invasive diagnostics fossils – Magnetic Resonance Imaging of pathological belemnites". Biogeosciences. 2 (2): 133–140. doi: 10.5194/bg-2-133-2005. ^ Hoffman, R.; Ansorge, J.; Wesendonk, H.; Stevens, K. (2018). "A Late Cretaceous pathological belemnite rostrum with evidence of infection by an endoparasite". Neues Jahrbuch für Geologie und Paläontologie, Abhandlungen. 287 (3): 335–349. doi: 10.1127/njgpa/2018/0720. ^ Donovan, S. K.; Jagt, J. W. M.; Deckers, M. J. M.; Laffineur, J. (2018). "Preservation of a heavily bored belemnite rostrum from the upper Maastrichtian of north-east Belgium". Proceedings of the Geologists' Association. doi: 10.1016/j.pgeola.2018.10.007. ^ Wisshak, M.; Titschack, J.; Kahl, W.; Girod, P. (2017). "Classical and new bioerosion trace fossils in Cretaceous belemnite guards characterised via micro-CT". Fossil Record. 20 (2): 173–199. doi: 10.5194/fr-20-173-2017. ^ a b Iba, Y.; Sano, S.; Mutterlose, J. (2014). "The early evolutionary history of belemnites: new data from Japan". PLoS One. 9 (5): e95632. Bibcode: 2014PLoSO...995632I. doi: 10.1371/journal.pone.0095632. PMC 4008418. PMID 24788872. ^ a b c d Dera, G.; Toumouline, A.; de Baets, K. (2016). "Diversity and morphological evolution of Jurassic belemnites from South Germany". Palaeogeography, Palaeoclimatology, Palaeoecology. 457: 80–97. Bibcode: 2016PPP...457...80D. doi: 10.1016/j.palaeo.2016.05.029. ^ a b c Fuchs, D.; Ifrim, C.; Nishimura, T.; Keupp, H. (2013). "Longibelus Gen. Nov., a new Cretaceous coleoid genus linking Belemnoidea and early Debrachia" (PDF). Palaeontology. 56 (3): 1081–1106. doi: 10.1111/pala.12036. ^ a b Miller, J. S. (1826). "Observations on Belemnites". Transactions of the Geological Society of London. 2. 2 (1): 45–62. doi: 10.1144/transgslb.2.1.45. ^ Stevens, K.; Mutterlose, J.; Schweigert, G. (2014). "Belemnite ecology and the environment of the Nusplingen Plattenkalk (Late Jurassic, southern Germany): Evidence from stable isotope data". Lethaia. 47 (4): 512–523. doi: 10.1111/let.12076. ^ Kröger, B.; Vinther, J.; Fuchs, D. (2011). "Cephalopod origin and evolution: A congruent picture emerging from fossils, development and molecules". BioEssays. 33 (8): 602–613. doi: 10.1002/bies.201100001. PMID 21681989. ^ Fuchs, D.; Iba, Y.; Tischlinger, H.; Keupp, H.; Klug, C. (2015). "The locomotion system of Mesozoic Coleoidea (Cephalopoda) and its phylogenetic significance". Lethaia. 49 (4): 433–454. doi: 10.1111/let.12155. ^ a b Iba, Y.; Mutterlose, J.; Tanabe, K.; Sano, S.; Misaki, A.; Terabe, K. (2011). "Belemnite extinction and the origin of modern cephalopods 35 m.y. prior to the Cretaceous−Paleogene event" (PDF). Geological Society of America. 39 (5): 483–486. Bibcode: 2011Geo....39..483I. doi: 10.1130/G31724.1. ^ a b Doyle, P.; MacDonald, D. I. M. (1993). "Belemnite battlefields". Lethaia. 26 (1): 65–80. doi: 10.1111/j.1502-3931.1993.tb01513.x. ^ a b Macleod, N.; Rawson, P.; Forey, P. L.; Banner, F. T.; et al. (1997). "The Cretaceous-Tertiary biotic transition". Journal of the Geological Society of London. 154 (2): 277–288. Bibcode: 1997JGSoc.154..265M. doi: 10.1144/gsjgs.154.2.0265. ^ Tanner, A. R.; Fuchs, D.; Winkelmann, I. E.; Thomas, M.; Gilbert, P. (2017). "Molecular clocks indicate turnover and diversification of modern coleoid cephalopods during the Mesozoic Marine Revolution". Proceedings of the Royal Society B: Biological Sciences. 284 (1850): 20162818. doi: 10.1098/rspb.2016.2818. PMC 5360930. PMID 28250188. ^ a b Taylor, P. D. (2002). "Fossils in folklore". Geology Today. 14 (4): 142–145. doi: 10.1046/j.1365-2451.1998.014004142.x.